JAKARTA – A new dating application will soon give Indonesian Muslim men wanting to marry multiple times more options in finding that second or third (or even fourth) wife. Initially launched earlier in 2017, the app was downloaded around a thousand times before being taken down pending a relaunch after founding company Pandu Solusi consulted with Islamic clerics. The app will require users to provide official identification and to supply a letter from the first wife consenting to the husband’s foray into polygamy, which is legal in Indonesia provided the first wife grants permission. For now the app’s webpage features a cartoon of a smiling hipster bearded man sat in front of a laptop, flanked by three women in Indonesian-style Islamic clothes, with two children. The happy family sits below an appeal for donations to help Myanmar’s Muslim Rohingya minority, whose plight in recent days has prompted protests in Jakarta by Islamists. The app is sparking debate in a country where almost 90 per cent of the 260 million population is Muslim, the biggest Islamic population of any country. 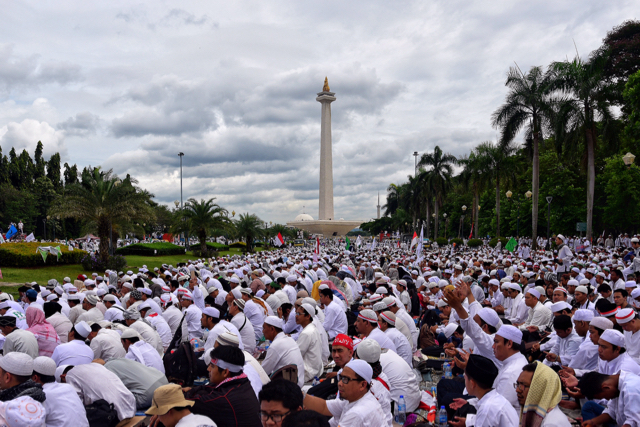 Though Islam in Indonesia is usually described as moderate and tolerant, hardliners are vocal and often take to the streets to pressure the government and courts. Islamic parties in parliament have tried to curtail alcohol sales, but so far have succeeded in only seeing beer taken out of fridge shelves in shops, while cities are likely to retain their thriving bar, club and dating scenes, the latter amped-up in recent years by social media. Tens of millions of Indonesians are on Facebook, Twitter and Instagram – Indonesia is the photo-sharing application’s biggest Asia-Pacific market – as well as on Tinder, the popular dating app that AyoPoligami is seemingly trying to adapt. “I don’t think the application will be popular,” said Bonar Tigor Naispospos of the Setara Institute, a Jakarta think-tank focused on religion and society.